It's party time! 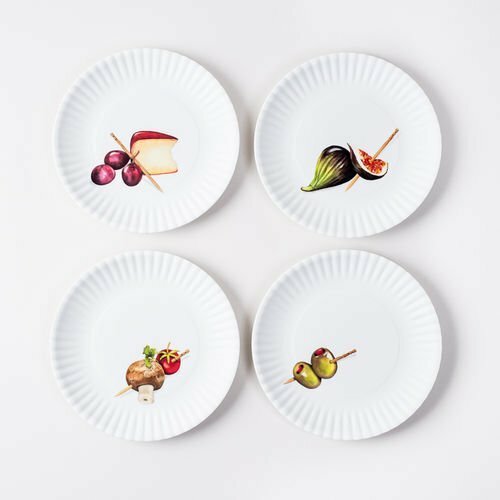 This sweet set of four, 6 inch hors d'oeuvre plates by One Hundred 80 Degrees look like traditional paper plates but are made of sturdy, reusuable melamine. They display fun and funky hors d'oeuvre artwork. An Eco-friendly alternative to the traditional disposable white paper plate. Better for the environment since they are reusable and won't fill up the landfills like paper plates. Dishwasher safe and sturdy - they won't get flimsy like the paper look-alikes. Best yet they will save you money over using disposable plates which always need replacing. An all around winner! BPA free. Do not microwave.